This weekend, my college roommate, Sarah, flew all the way from Omaha to visit me and meet L. I’ve known her for 12 years (man, I’m old) and we lived together for 3. She’s a forever friend; we have the kind of relationship where we pick up right where we left off whenever we see each other or talk. Naturally, our first order of business was to get relax, catch up, and get pedicures. The original plan was to go home and make dinner after, but we were starving by the time we finished up at the nail salon (getting pampered is hard work, people!) so we picked up JD and L and headed out for a yummy sushi dinner. Saturday morning, I treated her to my famous chocolate chip waffles, which I often make for guests… mostly because I like an excuse to eat them myself. L kept us entertained by crawling around, giggling, cooing, grinning, and just being a huge ham in general. Sarah was quite taken by her fat rolls (the kid can eat)! It was a beautiful day, so we headed to a nearby festival where there was a food competition and (supposedly) a lot of yummy food to try. I think we all had visions of gorging ourselves on lots of local specialties, but the festival turned out to be a bust. There were 2 sections- 1 for stew and 1 for other entries. None of us were really intrigued by stew and I only counted 4 entries in the other section, so we passed on the food. 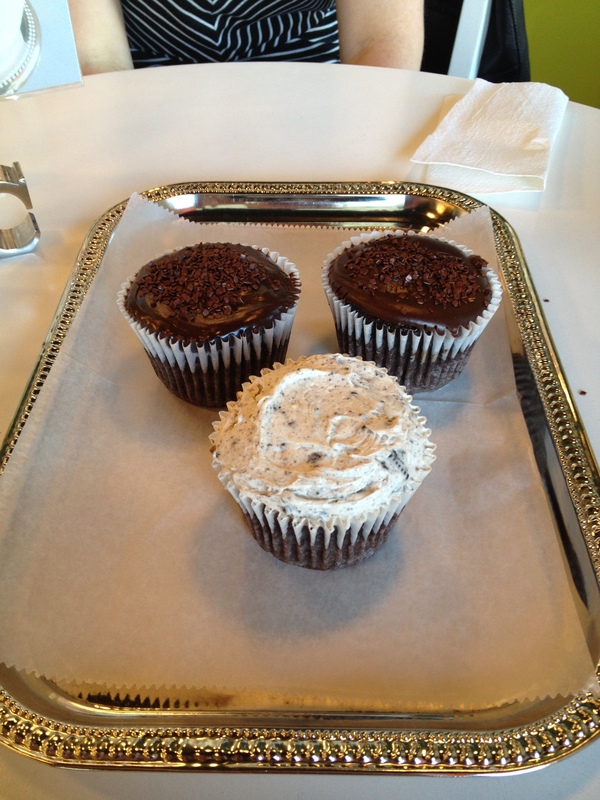 However, it wasn’t a total loss because we enjoyed the warm sunshine and found a delicious new cupcake shop. After dessert, we went home to make dinner and, naturally, bake more cupcakes. Sarah found a kind where you put an extra dollop of frosting in the middle of the cake part. There’s a reason we’ve been friends 12 years. 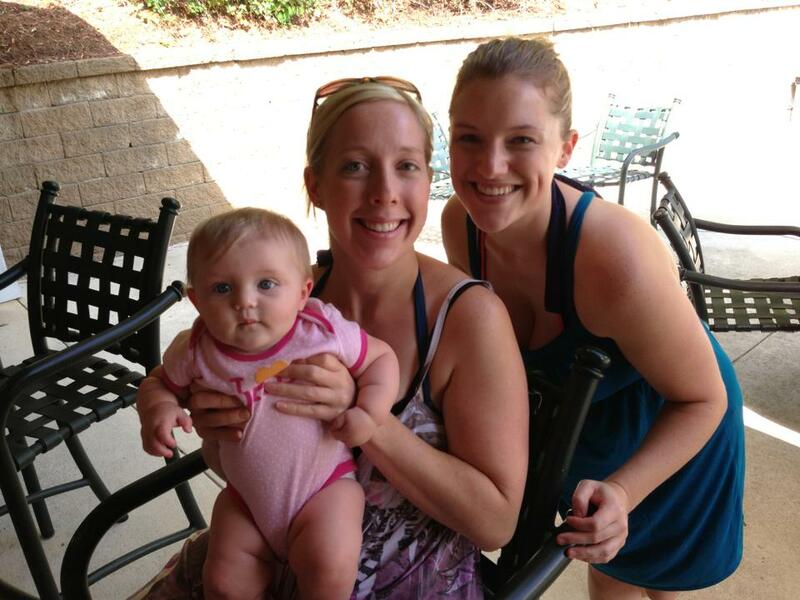 Sunday, we had a cookout and more time enjoying the sun at a friend’s pool. When Sunday evening rolled around, we realized the weekend had gone by way too fast. It’s hard living so far away from so much of my friends and family, but hopefully JD and I can make it out to Omaha next year (as it turns out, he also has a friend that lives in the area). Oh, yay! I’m glad you guys got to spend some fun time together! It looks like you had a blast! Cupcakes with frosting in the middle do sound really good! And I totally know what you mean about making the things you like when other people come over. There are several things that I’ve had to cut myself off of making when it’s just me and the boys around the house… but when company comes over I’m all for making a double batch:) haha!